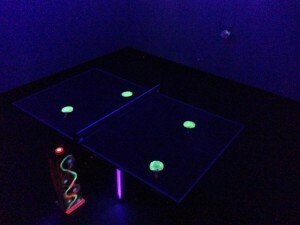 Pong Ping is an augmented reality table tennis (Ping-Pong) installation. A Ping-Pong table with 4 contact mics under it and 4 speakers in a quadraphonic configuration are filling the space. As the participant enters the location he is immediately submersed into an immersive environment generated by 10 ultra-violet bulbs (a.k.a black light) that create a fluorescent ambient inside the gallery. 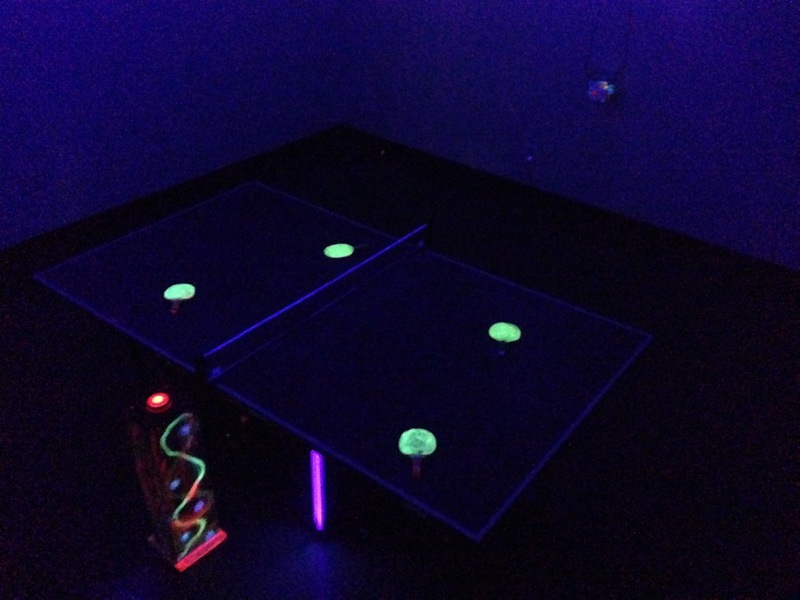 Most of the objects inside the gallery are fluorescent in order to react to the UV light including the lines on the table, the balls and the housing for the paddles. The users have the option of choosing between two states or two realities generated by sound and controlled by a big red button. When the button is pressed it triggers a process that synthesizes different types of sounds every time the ball bounces adding delay and frequency modulation to the sounds. When the button is pressed again it brings back the installation to its original state more organic, natural and quiet. The complete sound system is created using an Ambisonic encoder/decoder that allows to locate sound objects in a three-dimensional space and move them around it.